Due to lots of interest in Kody – we are no longer taking applications for adoptions for him. We have had many fab homes apply for Kody and now we will look to find the right one for him. Thank you. Kody is 8 months old and is needing a new home due to the other dog in the home taking a disliking to him. 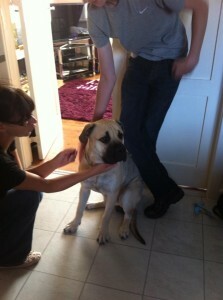 Kody is great with other dogs and children and is having lots of training and socialisation in his foster home. He is very loving and a gentle boy with all he meets.